Moscow, RUSSIA - May 23, 2011. Relying on existing users’ feedback, CoolUtils has developed a new edition of Total Mail Converter. The Pro version can convert attachments of the emails to the format a user especially needs. In such a way none of information stored in the mailbox will be lost or stored in improper form. It is not a secret that a lot of important data transferred by email is contained in attachments. These are different business reports, surveys, documents, price lists, etc. That is why not only email body should be converted, but also these attached files, if there is a need to create backup email storage or just archive old email history. Converting emails in such a way, a user can work with them locally, without Internet connection. And all these abilities are provided by Total Mail Converter Pro. The utility has a few attachments processing options available at user’s choice. They can either save them unconverted in separate folders, or include attached images into document (if any images are attached to the message, they will be inserted to a converted message copy), or convert attached documents (they will be converted to the chosen format and saved in a separate file). If the email has some attached email messages they can be converterted to the target format as well. The new feature was integrated into the standard settings wizard, equal to any of CoolUtils' converters. In the ‘Attachments’ inlay a user is able to checkmark the variant of their processing if needed. User is able to convert numerous emails in one batch, choosing one of five available formats: PDF, DOC, HTML, TIFF, TXT. Total Email Converter Pro supports both MSG and EML email formats that are used by all major mail clients. This makes the program compatible with any email application that are popular today. 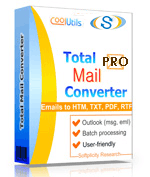 Total Mail ConverterPro runs on Windows XP/2003/Vista/7/8/10 and is available as a free demo download from http://www.coolutils.com/TotalMailConverterPro. Registered users can upgrade to the new version completely for free. For new users either product costs $99.90 (US). A free license is offered to any journalist or blogger by request.